and what little girl doesn't dream of having a tea party now? Girls of all ages want to go somewhere beautiful, to be pampered, to talk with other girls. And what is more perfect than a relaxing conversation with friends in a beautiful garden? Tea parties can be for any occasion--a birthday celebration, a going-away party, a bridal shower, a get-away with your cherished friends. Come make a memory with Make-A-Memory Tea Parties. We specialize in themed tea parties for children and garden tea parties for adults and families. 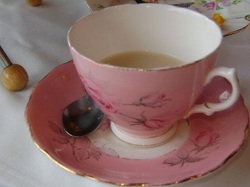 Located near Omro, Wisconsin, tea parties are offered in a woodland garden setting.